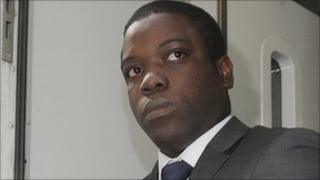 Alleged rogue trader Kweku Adoboli has pleaded not guilty to two charges of false accounting and two of fraud while working for Swiss bank UBS. Mr Adoboli of Clark Street, east London, appeared at Southwark Crown Court accused of unauthorised trading that lost UBS about £1.5bn ($2.3bn). The 31-year-old worked for UBS's global synthetic equities division, buying and selling exchange traded funds. Judge Alistair McCreath set a provisional trial date of 3 September. The judge remanded Mr Adoboli in custody. A pre-trial management hearing will take place on 9 April.